More evidence has emerged that the recovery in UK property prices is at an end. 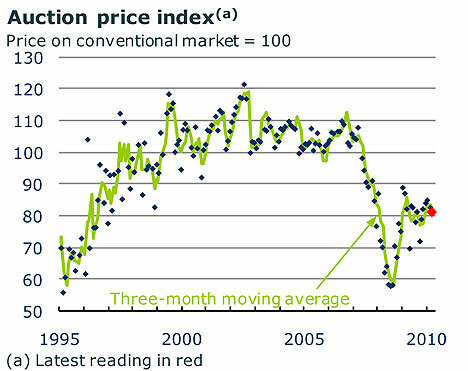 An index, due to be published later today, that aims to forewarn of wider market moves by tracking auction prices will point to a deterioration in the market. The prices of properties sold at auction versus the rest of the market widened last month, according to the Zoopla Auction Price Index, compiled by economic forecaster Fathom Consulting. The discount between homes under the hammer and the wider market was 19% in July, widening from 18% in June and 15% in May. There are some very interesting graphs at the bottom of the article. Amazing that at the peak of the boom houses were selling for more at auction than on the open market. I miss the auction threads. Who was that clever bloke who used to be able to pick up and post sold lots with the original sale price. Tommy Boy or suchlike? Sadly, as like all things in life, the only people now who fail to realise the property "game" of ever ending increases in house prices two years ago, are the suckers still holding real estate in which the "owner" is levereged to the hilt. These people and corporates are now left looking to offload to each other. Like minded souls are now sitting, waiting and watching either to pick up a home at a future date at fair market value or are aware of what has happend and deciding when to upgrade or downgrade. The property party is well and truly over. Realistically by the time the dust has settled the simple question will be, "at what level will the mean revert back to?" i.e. 2002 values or 2005? or 1999? Noone knows, but we can all have a good guess. Values which will hold will be those where the best yield can be achieved off capital value. So those with cheap to run housing near public transport, schools, hospitals, jobs etc in towns will be the true winners, i.e. those who will "lose" the least. Whilst such sellers are holding out for like minded over-leveraged fools, when they find them the finance isn't available to carry on living the dream. Hence the amount of properties that return to the market after going SSTC . Calling mods - a good index to add to others on the home page? Especially as it appears to be a leading index. Think it was Tommy Boy. I love those threads too. Brought a little bit of the thrill of the auction to the forum. Not to mention lifting my dreadfully mundane life a notch. Tommyboy indeed, he of the Dancing Bear avatar. Don't know where he went but he was regularly thanked for his auction threads. That's not what the graph says as it's a 3MOM change graph. What it does show that's interesting is that since the 2008, auction prices have only gone down (the line has failed to rise to 0% 3MOM). So no dead cat bounce in the auction world. The top graph is an index where 100 = price obtained on the conventional market via an estate agent. From 2000 to 2008 the prices obtained at auction were regularly above 100 therefore more expensive than on the open market. Post 2008 prices have dipped well below 100 meaning that auction prices are lower than prices via estate agents which is exactly how it should be to account for the extra risk taken by buying at auction. He noted the other days that the success rate at auction has reduced. A large proportion of vendors are receivers/mortgagees in possession and they would normally have a shrewd idea what to set the reserve figure at as they want to sell. The fall in the lots sold % indicates that they have been taken by surprise at the fall in the market and have set the reserve too high. The situation will correct itself by the resetting of reserves, but it shows how fast the market is now falling at the very sharp end, It will be interesting to see the results when the auction houses start off next month. 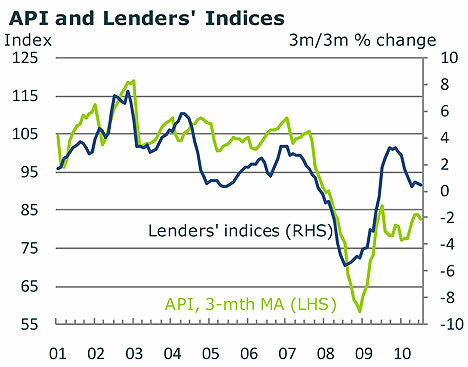 With bank lending showing no signs of improving, the buyers at auction are now the large investment companies who will be applying a much more professional approach to investment returns and factor into their calculations the true costs of owning a property. I am amazed how amateur investors look only at the gross yield and ignore the costs of property ownership and think a 6% gross yield is good notwithstanding that they are buying a geared investment.